Nothing escapes it: the JUNG KNX presence detector mini with integrated bus coupling unit in standard and universal versions. It is designed to control lighting systems, room thermostats, and other electrical loads as needed. Its compact structure is combined with options for ceiling installation. Depending on the particular room situation, there is a choice between installation in a false ceiling, on the surface, or in a commercially available flush wall box. Installation is quick and easy in each case with the supplied assembly sets. 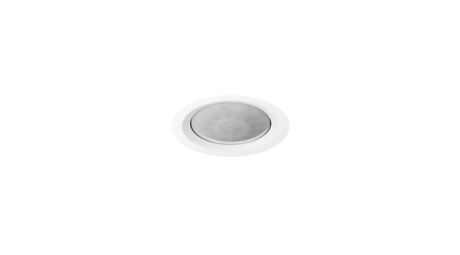 An advantage from its compact structure really comes into its own with installation in a false ceiling and the flush-mounted options: its virtually flush installation means that the KNX presence detector mini is hardly noticeable at first glance. With its discreet design, the device fits harmoniously into any atmosphere without drawing attention to itself. 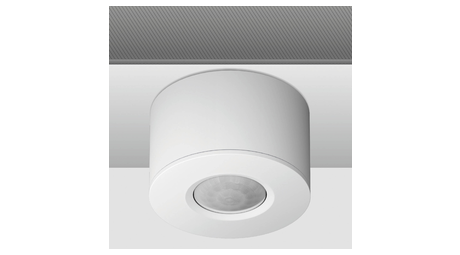 Depending on its configuration, the presence detector mini can be deployed for determining movement as a ceiling observer, for evaluating the presence of people and for room surveillance in signalling mode. The capture area can be extended as required with software that enables several devices to be switched together in parallel. To do this, a device is configured as the master and combined with several others, set up as satellite devices. The universal version shows perfectly the convenient and practical the design of this JUNG product. The five functional blocks of this universal version work independently of each other and can be switched between day and night operation. Each functional block can be configured as required for presence detector, ceiling observer or signalling mode, so that different tasks can be fulfilled with only one device, operating in different areas of the room. If required, regulation of lighting is also possible depending on daylight. Additionally the three PIR sensors with a total detection area of 360° can be individually analysed as required by software, so that the "view angle" of the sensor technology can be influenced for each parameter. And the presence detector also scores well when it comes to usability, with optional setting and usability with the universal version through infra-red remote control so that access can also be made from the ground. 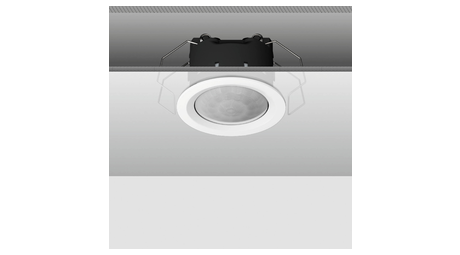 The compact solution for automatic lighting control. With the KNX brightness controller with integrated brightness sensor, the interior light control depends on the amount of daylight present. 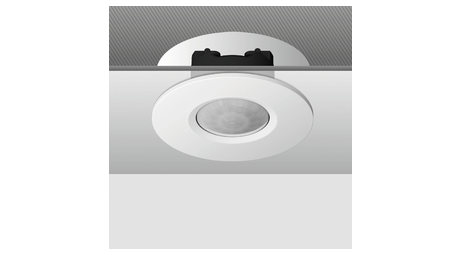 For this unit too, depending on requirements, the same three options for ceiling installation are provided as for the presence detector mini. 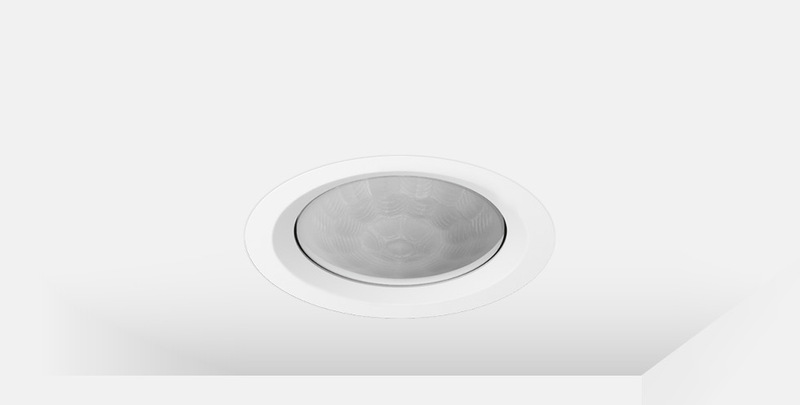 The brightness sensor with its harmonious proportions, "invisible" adjustment elements and sensor technology features an unobtrusive design that makes it inconspicuous on the ceiling. The most discreet installation type is definitely the clamp assembly in a false ceiling. The spring clips hold firmly, and only the lens and the narrow design ring can be seen from below. For flush-mounted installation of the presence detector mini or the KNX brightness controller, a separate flush mounting set is available in an off-the-shelf DIN 49073 flush wall box. The third option for ceiling installation is the surface-mounted version. Here, too, JUNG offers an individual set that contains a bezel as well as a surface cap to give it a consistent appearance.